Let our robots do the heavy lifting so that you don't have to! Loading, filling, capping, and labeling multiple bottle types with NO MECHANICAL SETUP! Fully automatic. No mechanical setup between runs. Hi, we’re Inventek. Your Automation Experts. Inventek Engineering is a California based Automation Services company and Systems Integrator. 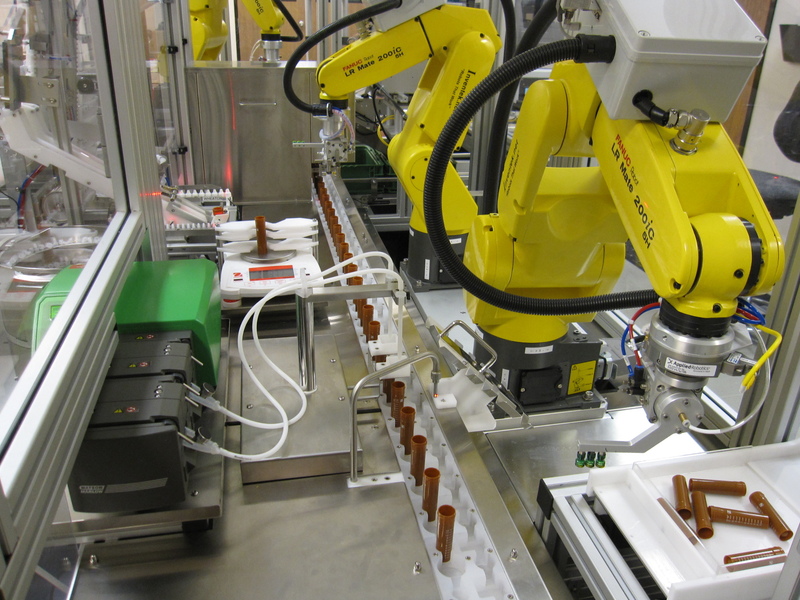 We are an authorized Fanuc Robotics Integrator and an Omron Business Partner. We provide creative and cost effective turn key solutions. Automation will improve your bottom line. Period. We understand the challenges represented by manufacturing because we have worked in countless production operations in the US and abroad. Automation will improve your bottom line. And we can help you get the results you need. Guaranteed. Click here to see how we helped Dako pharmaceuticals stream line their bottling process.